Connecting people to knowledge that can improve their quality of life is a privilege that we do not take lightly at IQ Solutions. Our commitment to health and wellness extends not only to our clients’ audiences but also to our own staff and our local community. Giving back is a natural extension of our vision, our mission, and our values. Our philanthropic initiative gives us the chance to apply locally the many lessons we’ve learned from more than 2 decades of serving the public health. 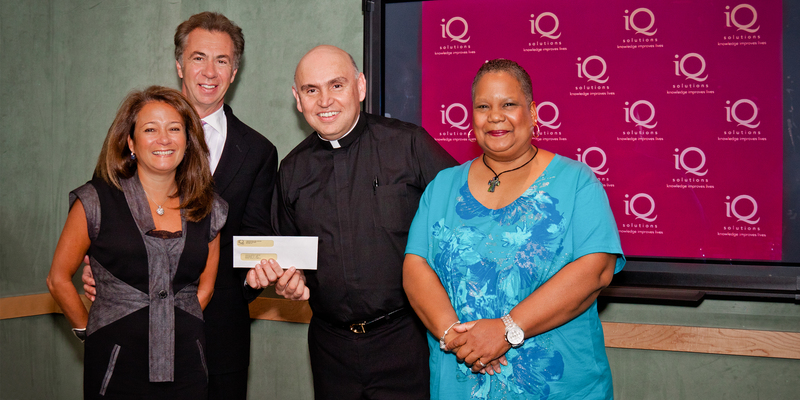 IQ Solutions gives back to the community through corporate and staff donations, staff time, and volunteer services. Each year, our Philanthropy Task Force gathers input from staff members about ways that they would like to give back. We match these interests with community organizations that could benefit from our expertise and that reflect our dedication to the underserved. Our professional assistance to pro bono clients has included website improvements, public health outreach, and professional creative services. For example, we have helped the local Spanish Catholic Center provide medical, dental, and social services by donating our expertise in strategic planning, materials development, and fundraising events. For several years, IQ Solutions has partnered with the city of Rockville to assist hundreds of families, seniors, and individuals in need during the holidays. Our staff members contribute generously to Thanksgiving food baskets, and they purchase gifts from the wish lists of local families. Our employees have volunteered as tutors in local reading programs, raised funds for medical facilities and research through races and walkathons, and generously contributed financially (with IQ Solutions matching staff donations) to relief efforts following disasters and other traumatic events. Our employees are enriched by the experience of coming together to make a difference. We also like to have fun while we are doing it. “Pop-up” fundraisers have taken the form of participating in the NCAA tournament brackets to benefit a local charity and making donations to Wounded Warriors that earn a pass to wear casual clothes on “Tag Thursdays.” This fundraising typically is matched by an equal corporate contribution. Engaging employees in our philanthropic initiative helps build a company-wide team dedicated to our values of genuine empathy for people, a passion to make a difference, and the drive to create innovative approaches to empowering wellness. And, more simply put, giving back feels right and enriches everyone involved.